Of all the trips I was most excited about, climbing Mount Fuji is ranked at the top. I knew I also wanted to do it towards the beginning of our tour in case we started a family sooner than later. Because I definitely wasn’t hiking it while pregnant or after having a baby. So when we saw prices for flights into Tokyo come down we decided to jump on the chance to climb Mount Fuji before the climbing season closed with one of our great friends who made the trip so much fun! 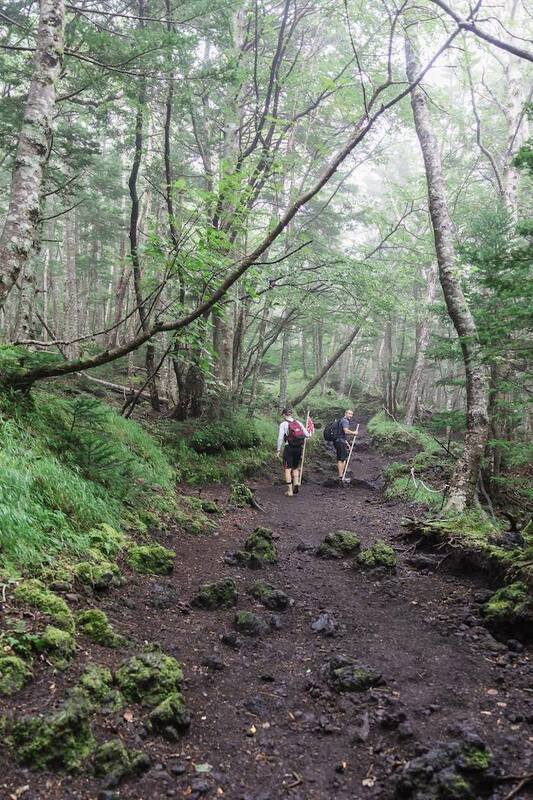 Quite a bit of planning went into this trip from flights, hotels, trains to the base camp of Mount Fuji, booking the mountain hut, and finally the actual hike, which you should definitely be training for before you go. I’ll break it down so you can plan your own epic hike of Mount Fuji! The climbing season for Mount Fuji is from July to September. We climbed it one of the last weekends it was open and I would recommend hiking it towards the middle of the season. The weather on the mountain is unpredictable no matter what time you go but at the very beginning and end of the season temperatures are more likely to be very cold, which is true to our experience. We booked flights through ANA to Tokyo (Haneda airport) for $263 each. You could probably save costs flying to Narita if you flew Peach or another budget airline and then take the trains to wherever you are staying. For our hotel we stayed at Hotel Sunroute Plaza Shinjuku, which was close to Shinjuku station and perfect for catching the train towards Mount Fuji. Rooms here ran around $115 a night which is a great price for Tokyo and had a western style room with private bathroom. We were also able to enjoy a few places around Tokyo but to keep this blog post from being a novel I’m just going to focus on our Mount Fuji trip and I’ll create another blog post that I’ll link to HERE in the near future. I had originally looked at Mount Fuji tours but after seeing how expensive they were we decided to just try doing everything ourselves. And as much as I love planned tours, climbing Mount Fuji is one you do not need to book a tour for at all. All of the trails up the mountain are very well marked and you will always see people along the trail traveling it with you. We decided we wanted to split the climb up and stay in one of the mountain huts halfway up and then hike to the summit the next morning to watch the sunrise. By the time I went to book our mountain hut the main trail (Yoshida Trail- yellow) mountain huts were already booked. This was disappointing but in the end it ended up being the biggest blessing of all. Instead we decided to book a mountain hut along the Subashiri Trail (red trail) instead ($110 per person with dinner and breakfast) and had the best experience because we did so. I’ll stop here to say that Subashiri Trail was awesome. And challenging. But it beat the Yoshida trail by far because we chose to come back down the Yoshida trail on the descent (which was the best route down after a hard hike and low cash on hand for our return bus trips lol) and realized that path was way too easy, basically a wide gravel pathway that people ascended up. Instead we were greeted at the Subashiri Trail with what you would expect from an ancient sacred mountain. Also be sure to grab a walking stick at the 5th station. It’s what they use to add brands to as you go up! This trail was not easy by any means but it is definitely doable. I have asthma and I was actually able to climb up this trail, with lots of stops for breathing breaks, with two fit men! And to my credit I did beat out a few other fit men along the trail so yay me! Lol. The weather was very unpredictable. On the first day alone it went from cold, to hot, to pouring rain, and back to cold just on the ascent to the mountain hut. Rain ponchos are a must! They were a complete lifesaver for us on the first and definitely the second day too! At the mountain hut we witnessed a beautiful sunset and it was like we were living within the clouds! It was so beautiful! The dinner and breakfast were so yummy and much needed after burning all the calories we did. The hut only accepts Yen so be sure to bring a lot of it. Whatever number you’re thinking of, double it just to be safe. We almost didn’t have enough Yen because I accidentally left some of my money back at the hotel in Tokyo. You’ll want Yen for food, the mountain huts, and for adding brands to your walking stick. Side note, we had our hotel in Tokyo hold our luggage overnight and we saved money by not booking a room the night we stayed on the mountain. The ascent to our mountain hut took about four hours total. We went to bed around 8pm that night to wake up around 2:30am to grab a to go breakfast and begin our ascent. I’m not going to lie, this, was the brutal part. It was freezing that morning and halfway up to the summit it began to pour again. What should have taken only two hours took three and a half hours because the Yoshida trail and Subashiri trail merges and it is basically like standing in line to see the summit. It was so slow and only our ski jackets and waterproof ponchos helped us get through. But when we finally got to the summit it was such a rush to know that we accomplished such a hard hike! All throughout the hike I knew that I was accomplishing something great! And even though it was so hard I knew the keep putting one foot in front of the other and that I would be reaching the top. Failure was not an option. Iphone pictures only at the summit because our fingers were too frozen to fumble with my fancy camera lol. The disappointing part was not being able to see a great sunrise because of the weather. But it was still really beautiful! And the rain also decided to give us a break as well! We decided to forgo the brand at the summit due to the super long line and not being able to feel our fingers at this point. I passed out hand warmers to everyone and we explored the crater at the summit and took a few more pictures before decided we were more than ready to start our descent. The descent down took only three hours. And at parts it was kind of fun because you could skid down and watch others fall on their butts and laugh when you did it too. After an hour we could feel our extremities again we were taking off our jackets because it was getting warmer. We descended via the Yoshida trail this time and it was a great decision since it was an easier path, which is just what we needed after climbing as long as we had. At the base of the Yoshida trail we were able to exchange the US dollars we had for more Yen and purchase our bus tickets back to Tokyo. At this base camp there were also lots of places to eat and a ton of facilities that the Subashiri 5th Station didn’t have. We grabbed a few snacks and some hot Georgia coffees from the vending machines before catching the train back to civilization. One thing you will want to pack besides snacks is wet wipes. On the return trip back to Tokyo I was able to wash up pretty well using them and change into some clean clothes, brush my teeth and honestly I just felt like a new, clean woman! Lol! Also, we were able to easily take our hiking poles back with us to Okinawa. We weren’t even charged extra for them on our flight. I don’t know if this is for every case or if it depends on the airlines or who is checking you in that day. We might have been lucky. Climbing Mount Fuji is an experience I will never forget! My legs were sore for a good week after our climb but it was all worth it! I’m so glad I took my professional camera as well too! I love the pictures we were able to capture! They are some of my favorites. This is a must do experience while you’re living in Okinawa or really anywhere in Japan or even South Korea while your stationed overseas. It’s a quick weekend trip and the memories will last a lifetime! I hope this is helpful to those of you thinking of planning to climb Mount Fuji in the future. If you have any questions comment below! Have you climbed Mount Fuji? Add any other useful tips for others looking to plan their climb!